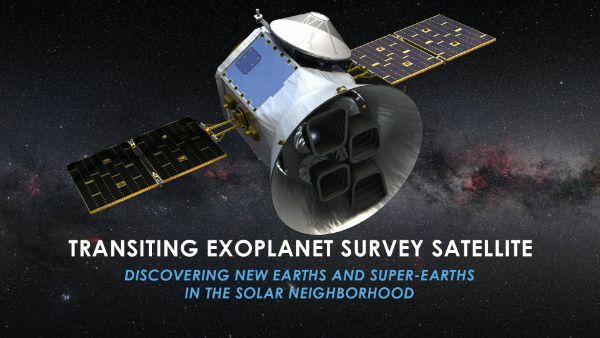 NASA’s search for Earth-like planets around other stars took one major step forward Wednesday night when the agency’s TESS exoplanet hunter received a smooth ride into a high-energy transfer orbit atop a SpaceX Falcon 9 – setting out on two months of orbit trimming and a lunar flyby before beginning the first-ever all-sky survey looking for planets in Earth’s cosmic neighborhood. Packed into a compact spacecraft weighing only 362 Kilograms, the Transiting Exoplanet Survey Satellite – TESS for short – will discover and catalog in excess of 10,000 new planets circling stars that are astronomically close to Earth to allow for follow-up characterization of their structure and atmospheric make-up in the continued search for planet’s other than our own where life could theoretically be possible. 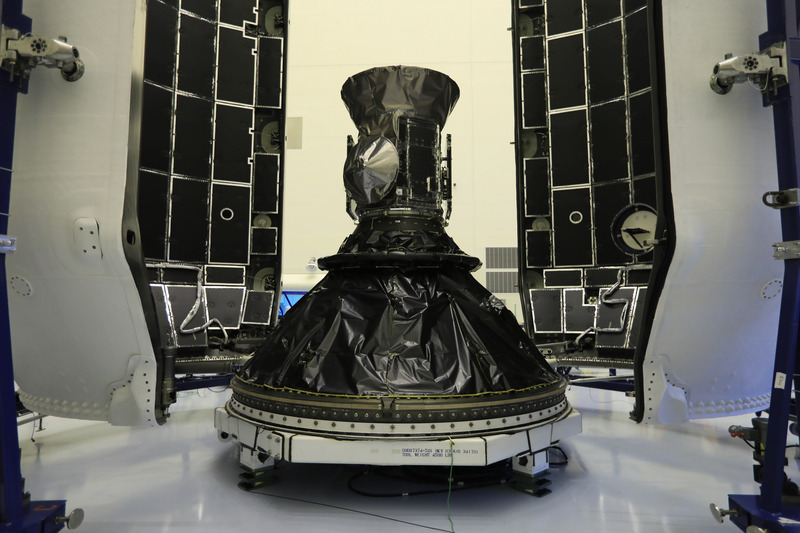 Sending TESS on its way toward a never-before-used Lunar Resonant Orbit fell to SpaceX’s final new Block 4 Falcon 9 rocket, certified by NASA this January to handle a priority delivery such as TESS. 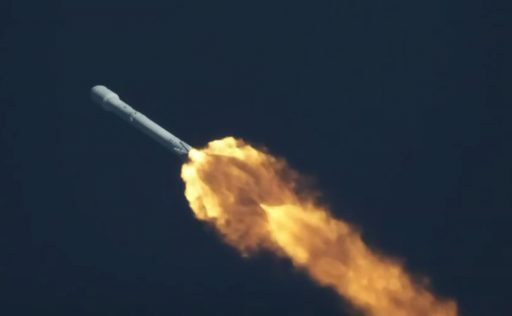 Falcon 9 fired off from Cape Canaveral at 22:51 UTC on Wednesday, 6:51 p.m. local, under the power of its nine Merlin 1D engines that pushed rocket away from the Space Coast straight to the East. Accelerating beyond the speed of sound one minute after launch, Falcon 9 kept firing its booster for the first 149 seconds of the flight before the MVac-powered second stage took over for a two-burn mission. Stage 1 – a viable candidate for a future Dragon mission for NASA – flew a sub-orbital arc, re-fired a subset of its engines to hit the brakes and successfully landed atop SpaceX’s Autonomous Spaceport Drone Ship under the power of its center engine to be towed back to Cape Canaveral for re-flight as soon as this summer. Tasked with the high-speed delivery of TESS, Falcon’s second stage dropped the protective payload fairing and kept firing for five and a half minutes to lift the lightweight spacecraft into a preliminary Parking Orbit. The stack crossed the Atlantic Ocean & Africa before Stage 2 fired up again over Indian Ocean, hitting a peak speed of 37,500 Kilometers per hour when shutting down its engine after a 53-second burn. 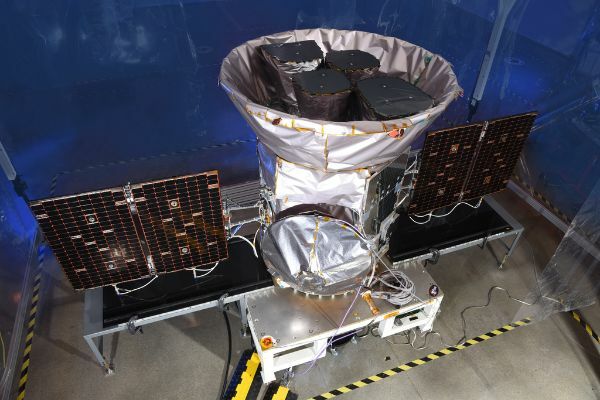 Loaded springs pushed the TESS spacecraft on its way 49 and a half minutes after liftoff and NASA confirmed its newest planet hunter was behaving well as it deployed its power-generating solar arrays and stabilized its orientation in space. Getting TESS to where it needs to be is all but a trivial endeavor and Wednesday’s launch only marked the start of a complex two-month up-and-down orbit ballet for the 1.5-meter tall spacecraft. All will depend on getting the timing right as TESS aims to thread the needle on May 17 for a critical lunar gravity assist that will pull the craft one large step closer to its operational orbit. 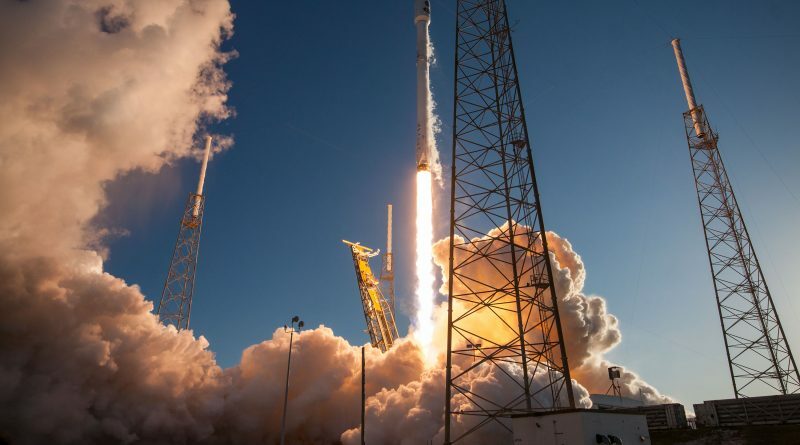 Falcon 9 only had a thirty second window to send TESS on its way – already timed to meet the lunar flyby, and the spacecraft will conduct a major boost when coming close to Earth again in six days to lift the high-point of its egg-shaped orbit to match the Moon’s orbital distance. 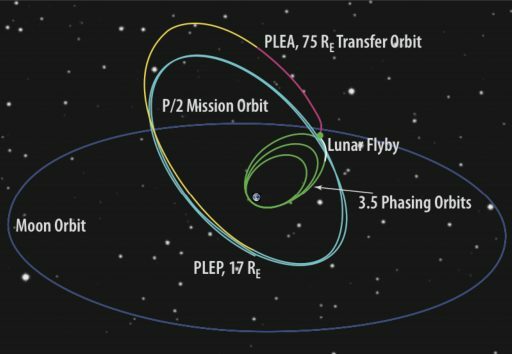 The next two orbits will be filled with correction maneuvers to refine the flyby path and another large maneuver comes after the Flyby to put TESS into a lunar resonant orbit of 108,400 by 376,300 Kilometers where it circles the Earth twice for every orbit the Moon makes. If all goes well, TESS will achieve its final science orbit 57 days after launch – a specialized orbit that has not yet been used by a satellite to date. It was chosen for TESS because it offers a very quiet observation environment enabling the craft’s four-camera instrument to stare at a sector of the sky uninterrupted for two weeks straight – logging the brightness of thousands of target stars to identify temporary dimming of stars as a tell-tale sign of a passing planet. TESS will keep staring at the same slice of the sky for 27 days before stepping eastward to the next sector – covering the southern hemisphere in the first and the northern hemisphere in the second year of its mission to capture data across 85% of the sky. According to the latest statistical assessments, TESS will find close to 5,000 planets around stars in our neighborhood of the Milky Way including around 250 planets in the Earth-sized and Super-Earth categories. Another 10,000 or more planetary candidates are expected to be found around fainter stars. TESS builds upon the legacy of NASA’s Kepler mission that launched in 2009 and so far has found 2,652 exoplanets, plus some 2,700 candidates still waiting for verification. But unlike Kepler which only monitors a small sliver of the sky and watches for planets around distant stars, TESS is optimized to cover a large piece of the sky and single-out which of our nearest stellar neighbors are host to planets. The hope is to identify a number of close planets that can be studied with Earth- and space-based telescopes to look at their structure and atmospheric composition to provide a conclusive assessment of their habitability. The TESS instrument is optimized to detect planets around stars 30 to 100 times brighter than those studied by Kepler with the primary goal of identifying planets orbiting in the habitable zones around their host stars where water can exist in its liquid form – a key requirement for life as we know it on Earth. 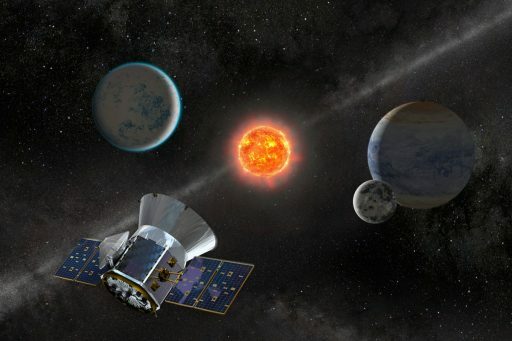 Prime candidates from the exoplanet catalog created by TESS will undergo further scrutiny by NASA’s James Webb Space Telescope aiming for launch in 2020; one of its primary objectives being the unprecedented characterization of exoplanets and their atmospheres. 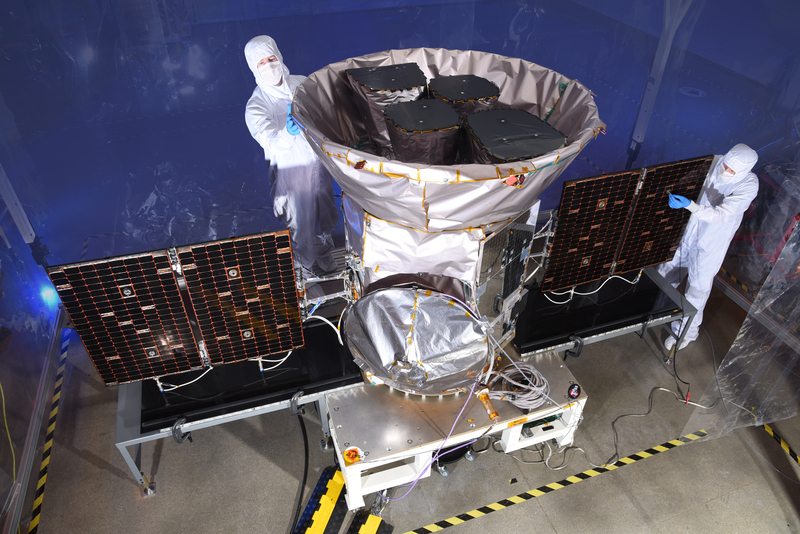 Built by Orbital ATK and fitted with four science cameras from MIT, TESS can cover a 24 by 96-degree sector of the sky at any given time – an area 400 times larger than Kepler’s field of view. Each of the four cameras comprises a seven-lens optical assembly, a spectral filter optimized for the near-infrared band of Red Dwarf stars and a 16.8-megapixel detector assembly with high sensitivity. By means of powerful onboard processing, TESS will be able to collect up to 15,000 “postage-stamp” images of target stars in each sector. Postage stamps will be collected with an image exposure of two minutes while full-sky images are collected every half hour. TESS will store the data it collects on board and send one burst of stored data once every two weeks when its orbit takes it sufficiently close to Earth to permit high data rates through NASA’s Deep Space Network. Getting the nod to lift TESS was a big deal for SpaceX as it represented the first medium-risk NASA science payload entrusted to the company and also marked the first time a dedicated NASA science mission was riding on Falcon 9 after two earlier deliveries – DSCOVR & Jason-3 – were for agency consortiums of which NASA represented only one part. 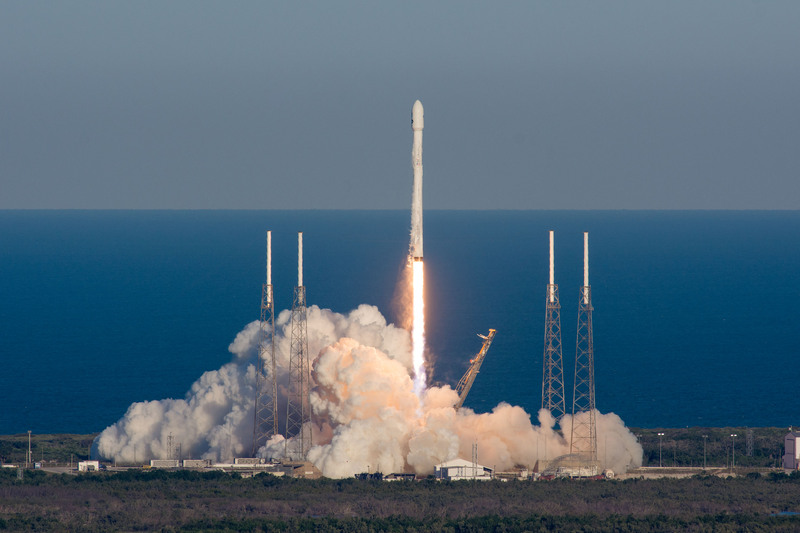 Launching TESS required a Category 2 certification awarded by NASA’s Launch Services Program to the Falcon 9 rocket in January and the TESS launch contract specified SpaceX to use a new Block 4 vehicle. Wednesday’s launch was the 53rd mission of a Falcon 9 vehicle, the 33rd for the Falcon 9 Full Thrust family and the seventh Falcon 9 of 2018 as SpaceX keeps up a high pace of launches to surpass its 2017 record of 18 successful missions. Out of seven missions performed this year so far, four Falcon 9 rockets have flown with previously used first stages. 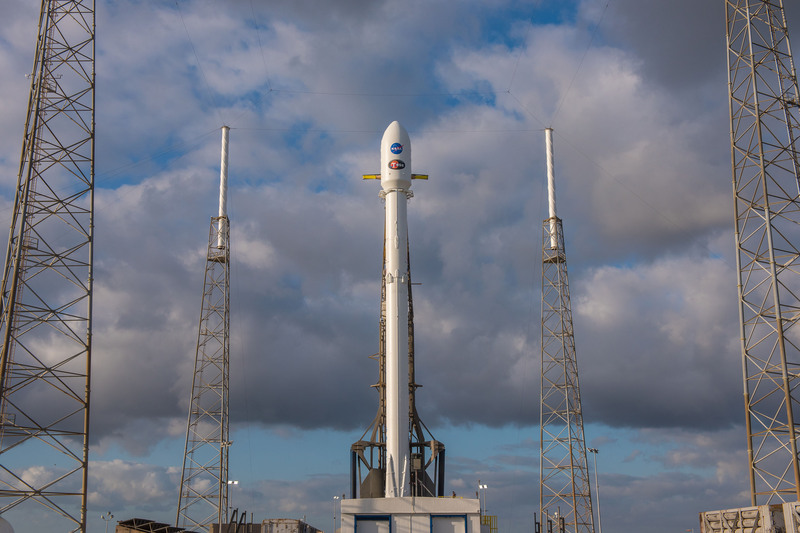 Wednesday’s launch came two days after an initial launch attempt for TESS was halted before the countdown progressed inside T-3 hours. SpaceX said additional GNC (Guidance, Navigation and Control) analysis was necessary and, as a result, pushed the launch by two days. It is understood that additional modeling of the second stage’s flight profile was part of open items discussed toward Monday’s T-0. Falcon 9 was lowered to a horizontal position after Monday’s attempt was abandoned and was back in its vertical position by Wednesday morning after all open items had been resolved, according to a status update given to all involved parties. Towering 70 meters over its Atlantic-side launch pad, Falcon 9 was cleared to head into another countdown, starting with a detailed set of checkouts while teams buttoned up the launch vehicle and SLC-40 launch pad. Launch Controllers in two control rooms at the Cape were able to award Falcon 9 a clean bill of health after a multi-hour checkout campaign and weather was also cooperating for Wednesday’s near-instantaneous launch slot – allowing computers to be handed control for the 70-minute automated countdown sequence encompassing the fast-paced tanking operation and a last set of reconfigurations on the two-stage rocket. The process of loading over 500 metric tons of sub-cooled Liquid Oxygen and chilled Rocket Propellant 1 into Falcon 9 ended just two minutes before launch when the vehicle had already switched to battery power, armed its autonomous safety system, and conditioned the nine Merlin 1D engines for ignition. 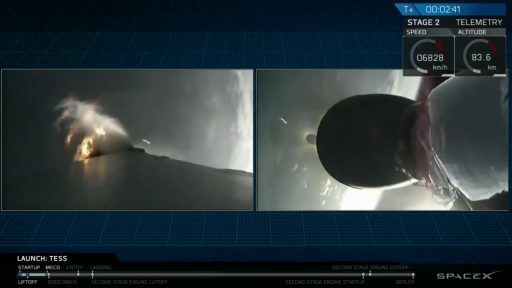 Tanks pressurized to flight level after the Launch Director voiced a final GO at T-45 seconds and Falcon 9 soared to life at T-3 seconds, ramping up to a launch thrust of nearly 700 metric ton-force. 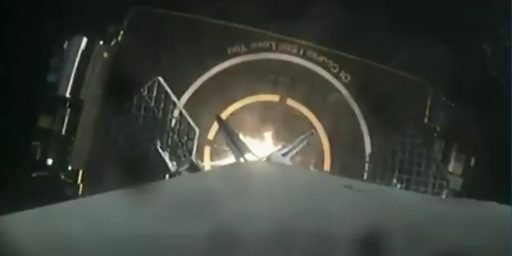 Falcon 9 lifted off at precisely 22:51:31 UTC, the opening of a 30-second window constrained by TESS’ tight timing requirements to intercept its lunar flyby window one month after taking flight. Balancing vertically for the first 15 seconds, Falcon 9 then swung on its planned departure to the East in order to begin its high-energy delivery. Consuming nearly 2,500 Kilograms of propellant per second, Falcon 9 pushed through the sound barrier at T+64 seconds and stepped off the gas while going through the area of Maximum Dynamic Pressure one minute and 16 seconds into the mission. The first stage then throttled back up and fired until T+2 minutes and 29 seconds, accelerating the vehicle to a speed of 1.95 Kilometers per second. 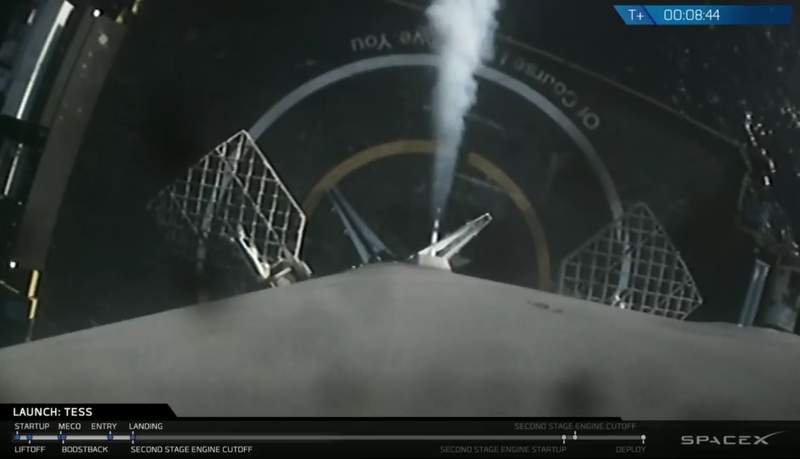 Stage separation – accomplished with four pneumatic pushers – sent the two Falcon 9 stages into different directions at an altitude of 75 Kilometers. While the first stage was to remain on a sub-orbital arc, the second stage fired up its 95,000-Kilogram-force MVac engine two minutes and 39 seconds after launch to lift TESS into orbit. Wednesday’s launch was the first SpaceX booster recovery mission since Falcon Heavy’s debut in early February. 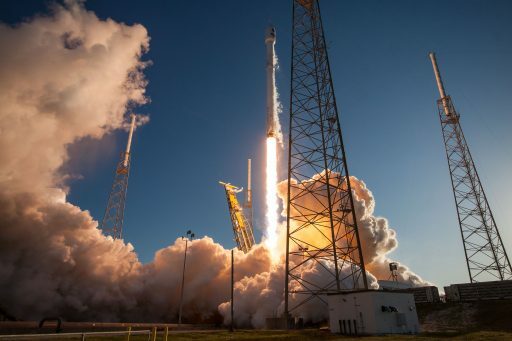 Four Falcon 9 missions since then discarded their first stages in the ocean after flight testing maneuvers – three were by choice as SpaceX cleared out its inventory before the arrival of Block 5 while one was by necessity due to rough seas in the recovery area. Separating from the second stage after flying a very lofted trajectory, the first stage made a quick U-turn to point its engine section toward the direction of travel for a 19-second, three-engine boostback maneuver, starting two minutes and 45 seconds after launch while the booster was still mid turn. This partial boostback controlled the downrange travel distance toward the OCISLY Drone Ship – essentially moving recovery closer to shore to shorten the travel time for the Drone Ship. Speeding back toward Earth, Booster 1045 re-started three of its engines for a 21-second Entry Burn six minutes and 29 seconds after launch. Having hit the brakes, the 47-meter long booster reversed through the sound barrier and employed its four actuated grid fins while descending through the atmosphere to steer toward the coordinates of the OCISLY Drone Ship, holding position 300 Kilometers from the SLC-40 launch pad. The booster fired up its center engine at T+7 minutes and 50 seconds for the landing burn, designed to arrest its vertical velocity at the moment it made contact with the Drone Ship. Four fold-out landing legs deployed in the final seconds of the rocket-powered descent and Booster 1045 made a bullseye touchdown on its floating landing pad after a round trip time of eight minutes and 21 seconds – bringing SpaceX’s total to 24 successful booster landings split evenly between land- and sea-based recoveries. 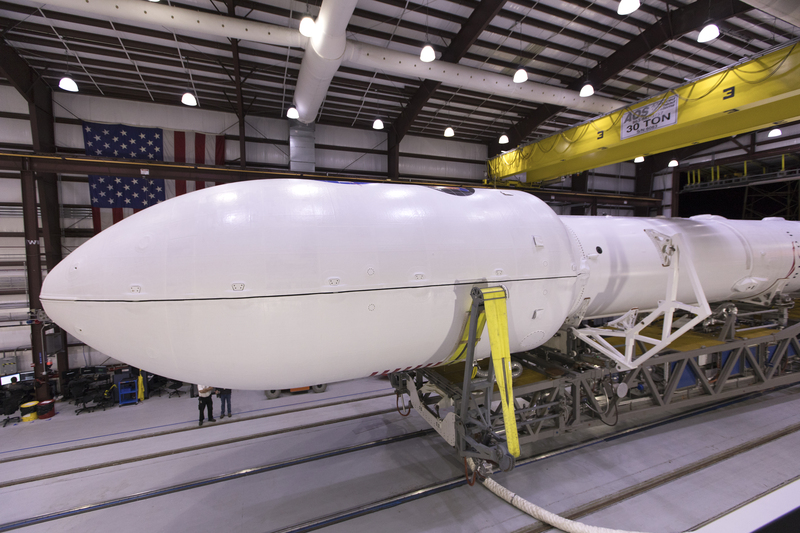 Provided all goes well with Booster 1045’s return to Port Canaveral in the next few days, it is a good candidate for quick refurbishment toward re-flight as early as late June on the next Dragon mission headed to the International Space Station. 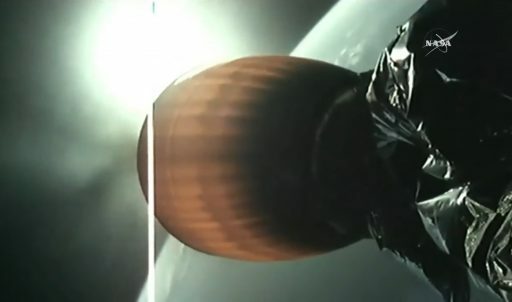 While the first stage was going through the motions of its return, the MVac powered second stage initially continued a steep climb – dropping the 13-meter long payload fairing three minutes and one second into the flight when passing 105 Kilometers in altitude. SpaceX planned to put Fairing 2.0 through an experimental return toward a mock landing target in the Atlantic Ocean in order to continue working on the precision of the landing recovery sequence by means of thrusters and auto-steering parachutes that will ultimately guide the fairing halves into nets deployed via sea-going vessels. Carrying its lightest payload to date, the second stage then leveled off to build speed until reaching a 250-Kilometer parking orbit, shutting down eight minutes and 20 seconds into the flight after a short burn of five minutes and 41 seconds. Next was a lengthy coast phase of 35 minutes to allow the second stage to continue flying east across the Atlantic Ocean and cross over Africa to reach the correct position for its second burn in order to appropriately position the apogee location of the resulting orbit. Re-start was confirmed at T+43 minutes and 10 seconds and the second stage was programmed to fire for around 53 seconds until reaching a planned Supersynchronous Orbit of 248 by 270,461 Kilometers, inclined 29.6 degrees. 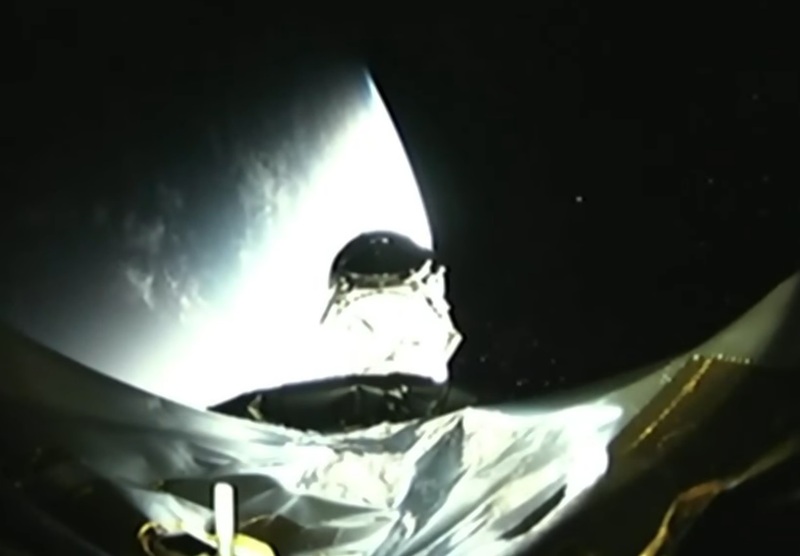 SpaceX launch controllers reported a good orbit was achieved and TESS sailed off at T+49 minutes, setting sail on two months of orbital trimming and instrument checkouts before its sky surveying mission can begin. A good deployment of the spacecraft’s two power-generating solar arrays was confirmed by NASA, indicating TESS was behaving as planned after being set free from the Falcon 9. 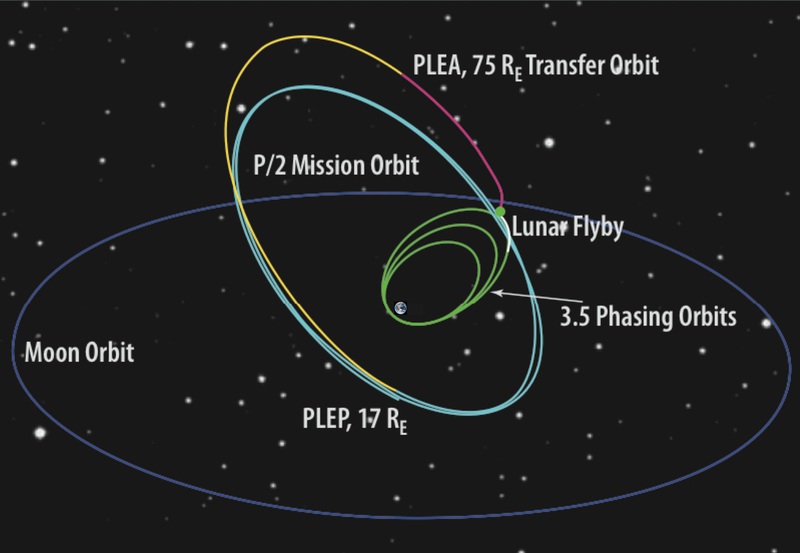 The mission’s next milestone, after undergoing initial systems activation, will be when reaching the peak of its elliptical orbit when a brief burn of its 22-Newton main engine will slightly lift the orbit’s perigee to ensure its stays well clear of the atmosphere. This will also act as a calibration firing for the thruster before the mission’s first big burn on the first perigee passage, designed to lift the orbit’s apogee to match lunar distance to get ready for the critical lunar intercept after another two and a half orbits. 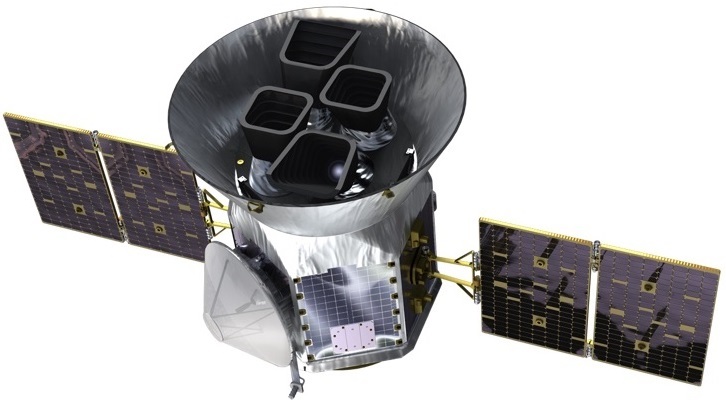 Although TESS will capture a treasure trove of data via its two-year primary mission, the spacecraft has been designed to last up to 20 years and the specialized orbit has also been simulated to be sufficiently stable for that period of time. However-long TESS may last, its scientific legacy is likely one for the ages as the exoplanets it’ll discover will be prime observation candidates for decades, if not centuries to come. For the Falcon 9 second stage, the day was not done at TESS separation as SpaceX planned to dispose the upper stage into a heliocentric orbit by firing its engine a third time to escape Earth’s gravitational influence.